Throughout our respective careers, we have worked with multiple large global and small companies as well as Board of Directors and investors. Our approach for any project is targeted towards a primary goal of being able to identify high-level and key factors that are inhibiting growth and profitability of the company as well as key areas/opportunities that exist for business operation and strategic growth while improving operational efficiency. We follow a step-wise approach in our work, starting with a high-level assessment followed by conducting in depth investigations of companies or investment opportunities. 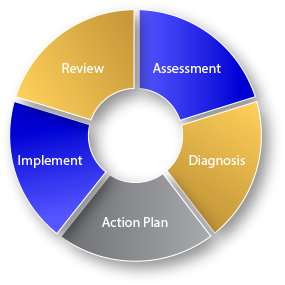 The systematic approach that we take is aligned with the following proven methodology.